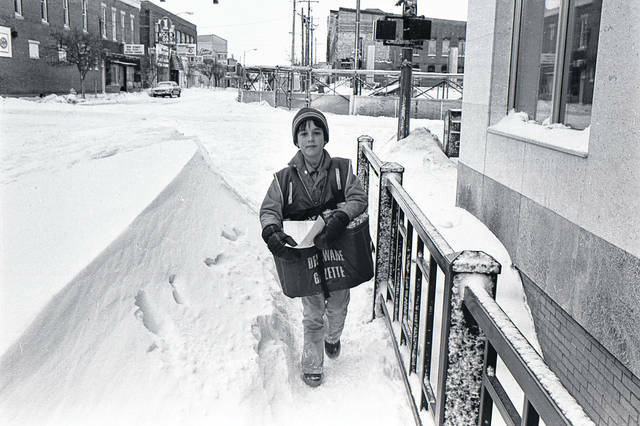 The Great Blizzard of 1978 didn’t stop Chris Brien, who was 11 years old at the time, from delivering The Delaware Gazette. Brien was one of about 44 carries that year who delivered papers to city residents. Brien is pictured walking west on West Winter Street between a 4-foot snow drift and the Delaware County Bank, which is now First Commonwealth Bank. In the background, construction had just started on what is now the PNC Bank building on North Sandusky Street. The building also houses The Gazette office. The photo was taken on Friday, Jan. 27, 1978, by Rex Welker. Courtesy | Delaware County Historical Society. As the world’s greatest events have unfolded over the past two centuries, The Delaware Gazette has brought the headlines and stories that matter to the residents of Delaware County since Oct. 1, 1818. That’s right, Delaware County’s longest-running newspaper, The Delaware Gazette, will have served its community for 200 years as of Oct. 1, 2018. In that amount of time, the newspaper has covered the spectacles of the Mexican American War, the Civil War, the Spanish American War, World War I and World War II, just to mention a few events. In honor of The Gazette turning 200 years old, the Delaware County Historical Society (DCHS) has taken the lead in researching the archived newspapers of the county. Through its research efforts, the DCHS has found there have been more than 50 different newspapers throughout the years in Delaware County. With research in hand, the DCHS has curated an exhibit — “200 years of Newspapers in Delaware County” — at the Meeker Homestead Museum, 2690 Stratford Road, Delaware. The exhibit, which is open from 2 to 5 p.m. on Sundays through December, opens up the pages of 200 years of chronicled history that was provided through the stories, photos and advertisements in the newspapers of the county. Surprisingly, the early articles in the newspapers were reports from Paris, London, Washington D.C., the Ohio Statehouse, Columbus, Cincinnati, Cleveland, Dayton, Lancaster, Marietta and Hollywood, with barely any mention of Delaware County news. Most of the local news pieces were public notices from the Village of Delaware or the county commissioners. Logan said one of the more interesting subjects she has been asked to research was for a local reenactor in regard to a woman from Delaware who lived around the Civil War era. In her research, she found announced in the Daily Journal Herald, a Democratic newspaper of Delaware County, that the woman’s husband died in the Civil War a week or two after they had married. Logan did mention that from the research in the old newspapers, the woman did donate a large amount of money to Ohio Wesleyan University for a building. Logan, a former librarian employed by The Ohio State University, has lived in Delaware County since 1983. She has volunteered at the historical society’s library since 2010. It is the hope of The Gazette’s current staff to honor the long-standing periodical over the next few months with stories from the old newspapers that have been a part of Delaware County over the past 200 years. As part of the upcoming series, former employees are being asked to share their stories of working for The Gazette by submitting them to delnews@aimmediamidwest.com or by calling 740-413-0902.
https://www.delgazette.com/wp-content/uploads/sites/40/2018/08/web1_newspaper-boy-copy.jpgThe Great Blizzard of 1978 didn’t stop Chris Brien, who was 11 years old at the time, from delivering The Delaware Gazette. Brien was one of about 44 carries that year who delivered papers to city residents. Brien is pictured walking west on West Winter Street between a 4-foot snow drift and the Delaware County Bank, which is now First Commonwealth Bank. In the background, construction had just started on what is now the PNC Bank building on North Sandusky Street. The building also houses The Gazette office. The photo was taken on Friday, Jan. 27, 1978, by Rex Welker. Courtesy | Delaware County Historical Society. This entry was tagged 200-years, D. Anthony Botkin, delaware county historical society, Delaware County Ohio, Newspapers, Susan Logan, The Gazette. Bookmark the permalink.